Pick your destination. Think carefully about what you really want. Look at your shoes. Your first step: Get new shoes. You will not have to map your route to your destination. You will be guided. All of the people you work with from now on will be your guide to the destination you have chosen. If you are clear about what you want, are truthful when people ask you what you want, and make yourself humble and available to guidance, you will reach that destination. If you chose Local Sports Bar Owner, you will be guided there. If you chose Celebrity Bartender On A Reality Show, you will be guided there. Some of your guides will explicitly help you and say, “Your next step is to put this glass in this spot.” Some will be less obvious and say, “I’m not sure this is a great fit.” Some will shrug and their disinterest will help you. Some guides will be outright warning signs. All of them are guides, and none of them know how to get to where you want to go. Your destination is yours alone. They may have some idea of how they themselves can get where you’d like to go, but their path and yours are not the same thing. Your first job is to observe. Watch the way the other kid in the black shirt puts away the glassware. Watch the way she puts away the beer. Watch the way your boss looks at the beer when she’s done. Turn on all of your sensors. Observe with all of your senses. Watch the way the bartender holds his hands when nothing is going on. Watch the way he dries his hands. Watch the way his boss looks at him when he’s working. Notice how you feel when you observe that. Your second job is to do. Jump in. Ask questions. Get your feet wet. Get your hands dirty. No matter what you are told, do it. When you have to do it a second time, do it faster. When you have to do it a third time, do it faster and cleaner. Get on your belly and clean something. Find a ladder, get up there, and clean that. Faster. Catch your boss watching you. Notice how you feel. Your third job is to get watched. All the time. Feel the eyes of your peers upon you. Sometimes you will feel their envy. Sometimes they will cringe. Sometimes they will look awed. Sometimes they will laugh. Ask for feedback. Ask how they would do it if they were you. Feel the eyes of guests on you. Begin to notice that you are on a stage. Try moving more artfully, knowing that you are being watched. Fourth: Expose yourself. Go places. Taste things. See the outside. Look inside. Notice. Notice. Notice. Remark. Take risks. Enter contests. Develop a menu of drinks you love (and make those Cosmos). Make a menu that sells itself and notice how you feel. Pour your soul into a project and feel the boots trample on it. Get up. Pour your soul into a project and feel rewarded. Develop a character that speaks for your projects. Develop a voice. Speak. Recite. Write. Repeat. In a mirror/on a tablet/in a text/on your grocery list/in your pillow/to your friends/to your mother/to a stranger. Say, write, repeat: Every single drink recipe you ever see. Every single drink recipe you ever hear. Every single drink recipe period. Spend a paycheck. Get the booze. Have a party. Make, say, make again, over and over. When you catch yourself reaching for the bottles before you remember what’s in the drink, then you are starting to get it. Speak up. Ask. Ask if you can help. Ask if you can run the drinks for a busy server. Ask if you can show the new kid how to juice. Ask if you can pull the tickets off of a colleague’s printer. Ask if you can make a few tickets. Ask if you can taste their contest entry. Ask them to taste yours. Ask if you can do the money. Ask if they will check your work. Ask if you can do inventory. Ask to look at the invoices when the fruit comes in. Ask to look at the liquor invoices. Ask if you can close for a sick colleague. Ask if you can close for a burnt out manager. Look over the bar top. Look at the women ordering. What do their faces do when they drink what you made? Do their eyebrows go up and away or down and together? Look at the men. They are better trained not to react. Look back at the women. Look at the entire bar from six paces. Go straighten your bottles. Wipe the sticky ones. Watch the fingers of the man on a first date. Offer food if his hands are too frantic. Listen. Listen to the bartender ask an older man how he likes his martini. Listen to the hungover barback polish with a cloth that is too dry and isn’t working. Listen to the dishwasher, and learn what a broken glass sounds like. Our senses are sight, sound, smell, touch, taste, intuition. Get a nice apartment. (Nice for sleeping.) Get a place where you can sit outside within a ten minute walk. Just a bench where you can sit and wonder what’s next. Fall in love. Sleep with a few people. Don’t give it away. Live with someone. Your time will be ever more precious. Don’t f*(& everyone. Your mate is curious to discover who you are going to be. You are dying to know how their story turns out, and hope that you’re in it the whole time. Whether it’s kids or animals or plants, get something living and care for it. Be reliable. Pay your rent on time. Get your oil changed. Pay your taxes. When you find a home, put down roots. Take your time. Don’t settle. But settle eventually. Have a local. Know your neighbors. Bring your garbage cans in. Pick up litter. Say hi to kids. Watch the news. Know who’s on the ballot. Vote. Watch your community change. Engage with the people who are trying to change it for the better. Take a Saturday off to clean a park. Host a fundraiser. Be known. Play. Tell jokes. Pick up an instrument. Find your perfect ball: golf, tennis, soccer, foot, basket? Be a fan of a team. Root for someone. Dance. Sing. Ice someone. Prank. Punk. Look silly for the laugh. Remember you are not the drinks you make, you are not the glasses you polish, you are not the people you train nor the bars you build. You are not the children you create. You are not the failures you suffer. You are not the awards you don’t receive and deserve. You are not your undeserved kudos. You are who you are and what you believe. 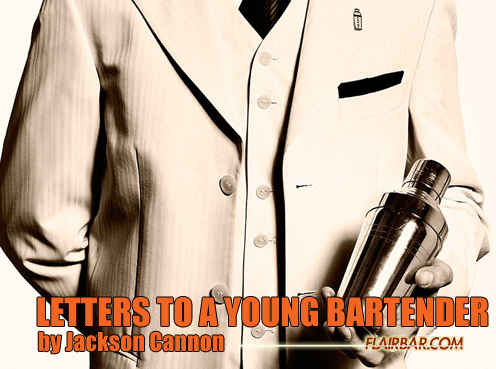 If you are a bartender, you will know it, and so will the world. Batch Cocktails the Right Way!